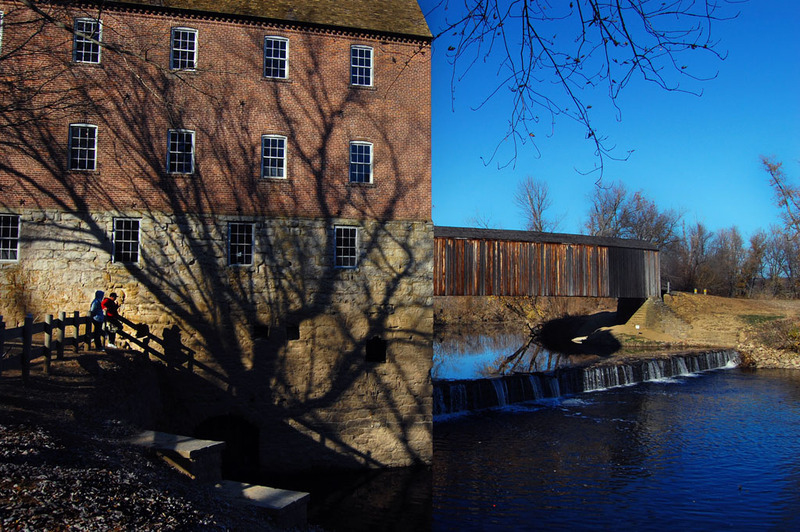 Burfordville has a historical two-fer: the Bollinger Mill Historic Site and the Burfordville Covered Bridge. I’ll post photos of the bridge tomorrow. 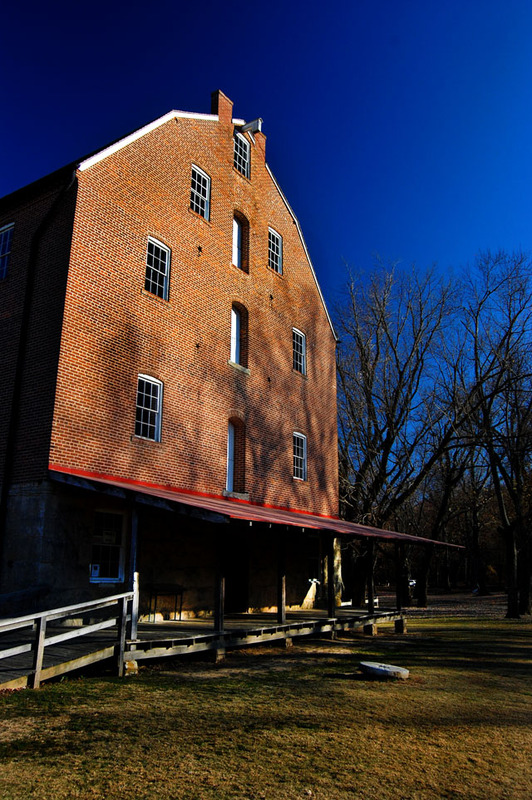 The Missouri State Parks and Historic Sites website says three mills have been located at this site over the last 200 years.Union forces burned the mill to keep flour and meal out of Rebel hands during the Civil War. Only the foundation remained. 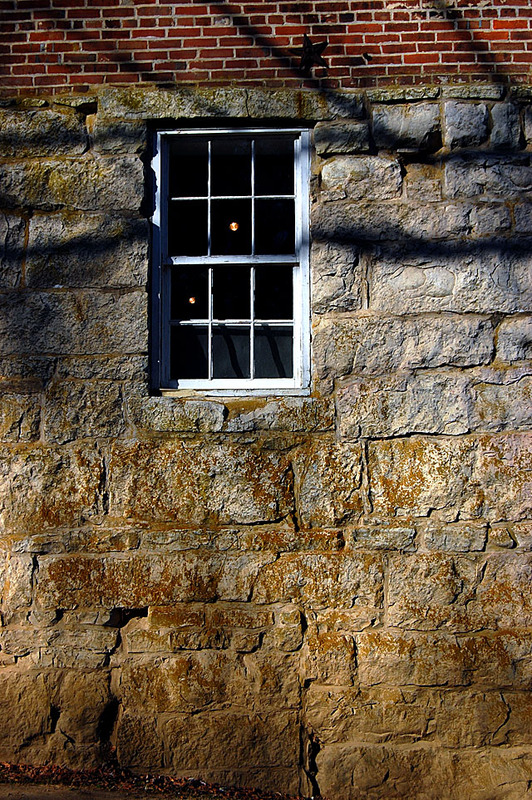 Solomon R. Burford, for whom the town is named, rebuilt the mill in 1867 upon the original foundation. His initials are still visible on a wall inside the front door. 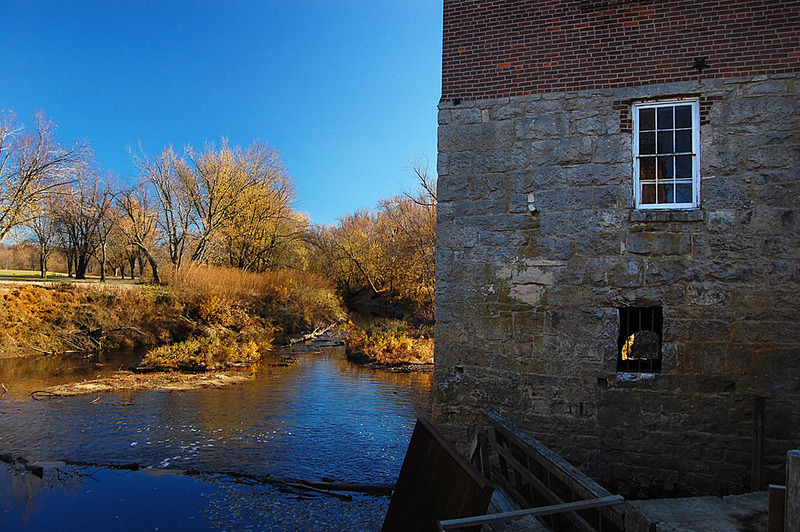 We just missed being able to tour the mill and watch corn being ground into meal by water power. 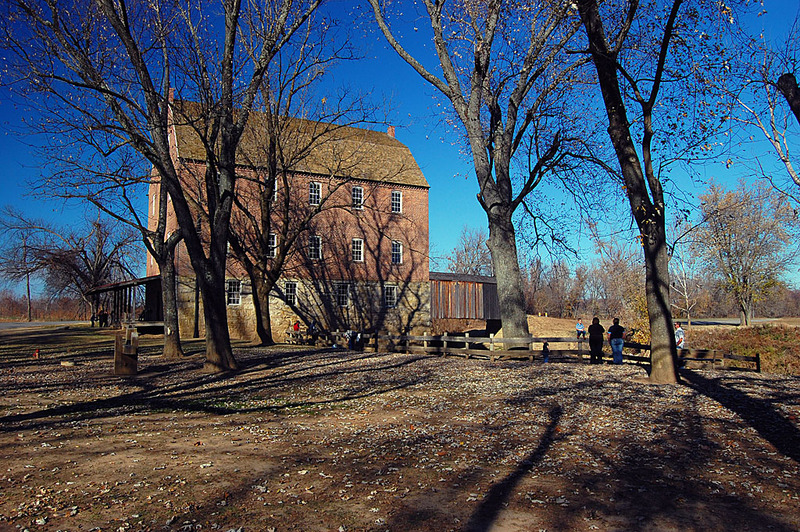 During the winter season – November through March, tours are given by appointment only. 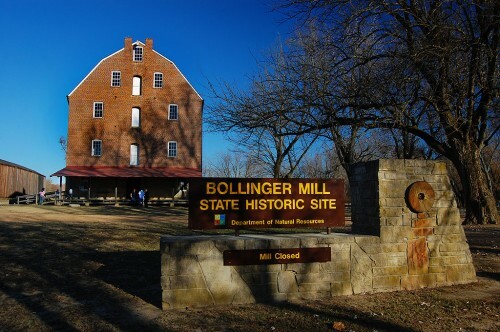 The Vandivort family, relatives of George F. Bollinger, bought the mill in 1953 and turned it over to the Cape Girardeau County Historical Society in 1961 which, in turn, donated it to the state park system in 1967. You can see the hours at the website. 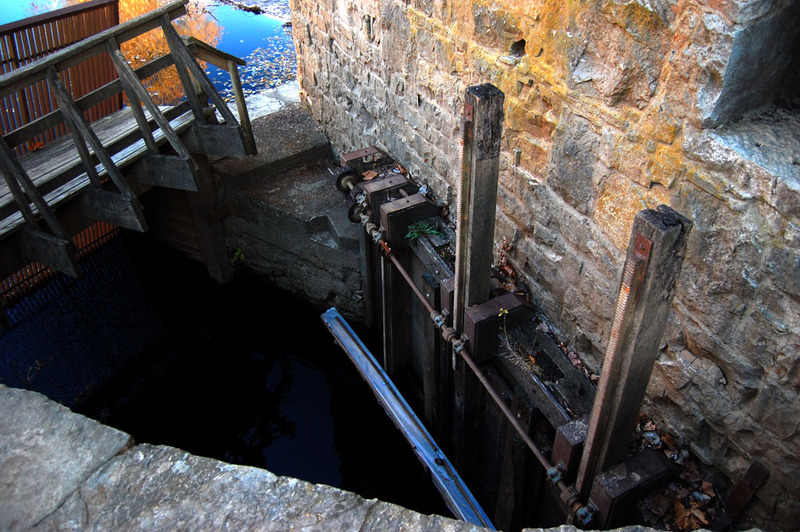 A dam holds back water that is diverted through a sluice gate into the mill. 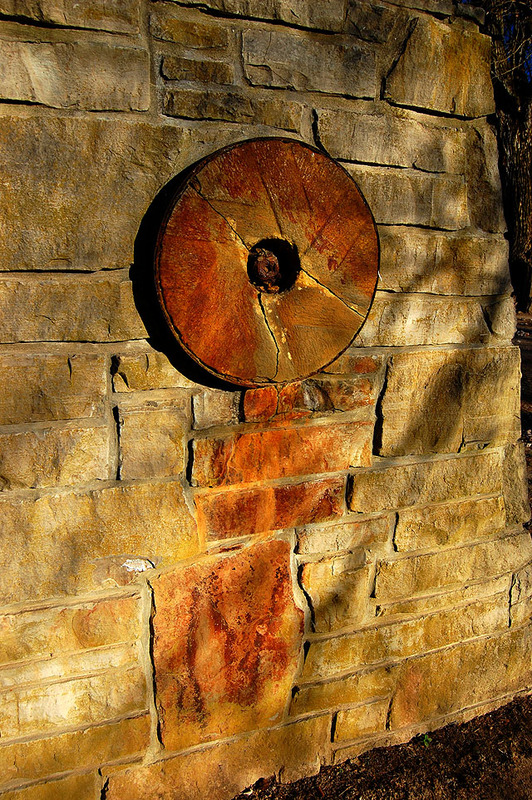 The dam was originally built of logs, but it was rebuilt in stone in 1824. The limestone foundation and dam still exist. Water enters the mill through this gate and passes through a water turbine. 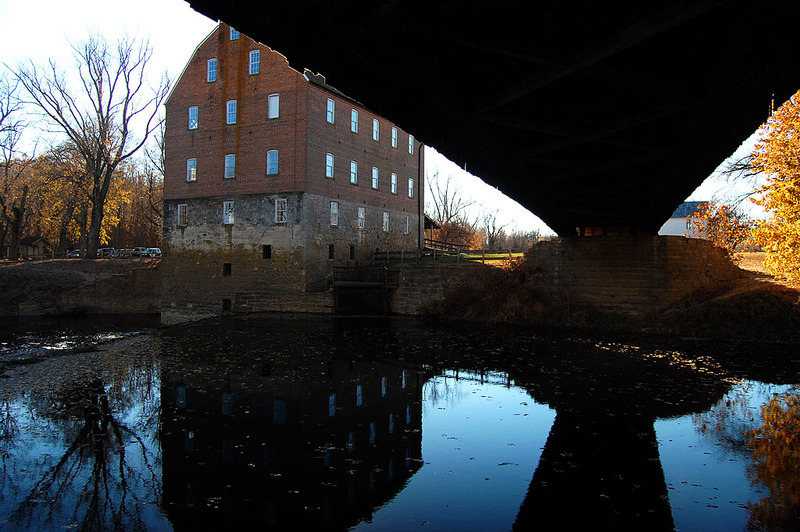 The Mill and covered bridge are favorite photo stops for tourists. I met folks there from around the area, California and Texas (Florida, too, if you count me). 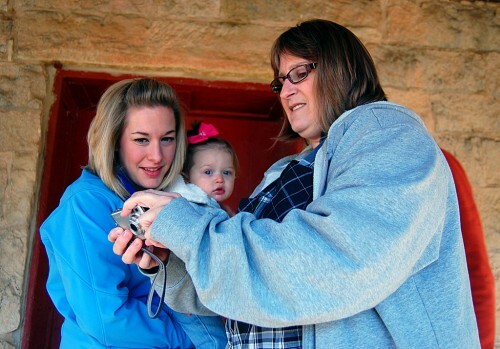 Despite that, I can’t think of any memorable photos I ever took at the park. I guess it always felt too “touristy” for my taste. 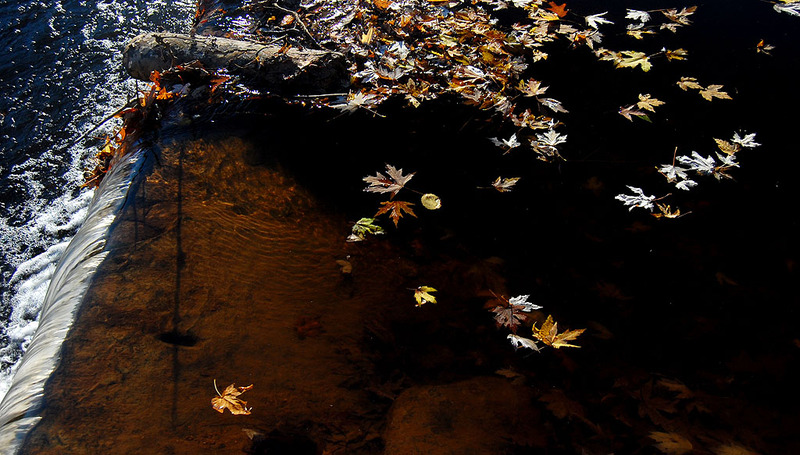 Click on any photo to select it, then click on the left or right side of the image to move through the gallery. Don’t forget to come back tomorrow to see photos of the Burfordville Covered Bridge. Thank you… on behalf of my family – The Vandivorts, for posting these pictures. When we have our annual Family Reunion on the 4th of July many of us head to the mill first. WE love to climb the hill behind the mill and visit the graves of our ancestors, tell our children family stories of the settling of this area, and enjoy the magnificent surroundings. Harriett Stein Smith – Vandivort Properties LLP….a 5th generation family farming corporation. Thank you for leaving this legacy for future generations. If your family hadn’t done this, it would have been turned into matchsticks like the mill in Frohna. 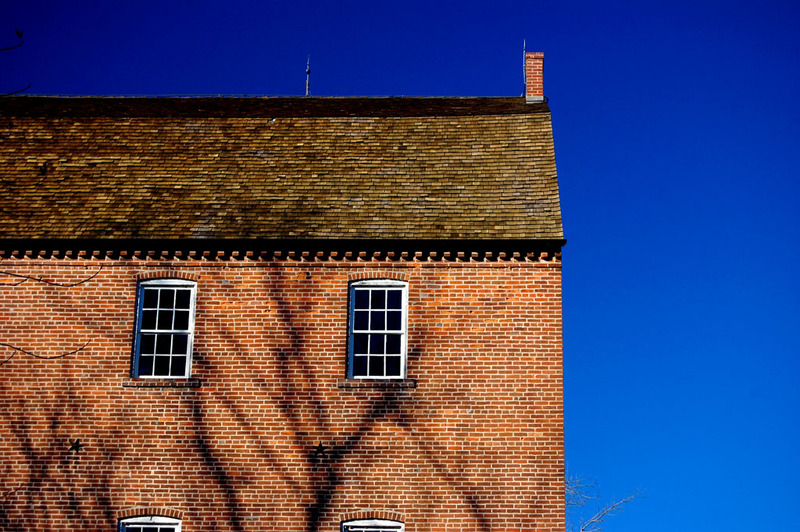 If the Burrough family had been as generous, what was described as the “one of the state’s best example of a Pre-Civil War farmstead” would be in the public trust instead of being bulldozed for low-income housing. Thanks for thinking of your community. 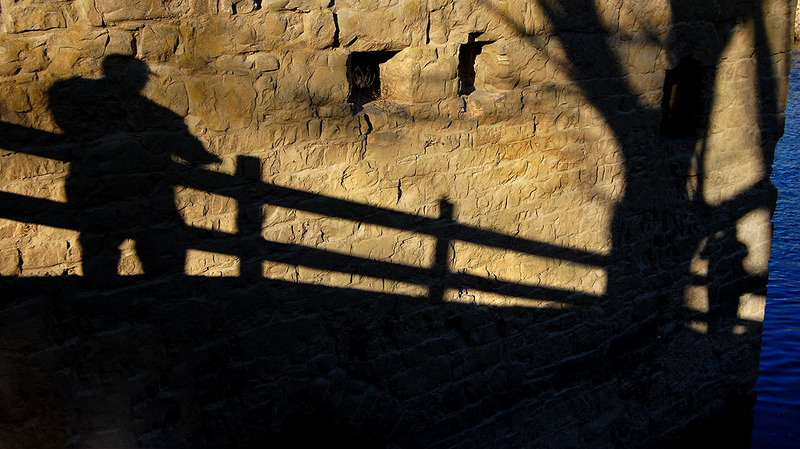 Top notch…shadow pic! Sad to think of all the history that have been lost in not saving historic buildings. Thank you to the Vandivorts for saving this slice of history! I tried to work the shadows in the first shot and the last one. They came close, but didn’t really come across for me as well as I had hoped. My aunt and uncle lived in Burfordvlle just down the road from the mill. When we went to visit them, I would begin thinking about the covered bridge as soon as Dad started the car, and then start asking to cross the covered bridge when we made the turn at Starlight. I know we are unable to save everything from the past, but I am very happy the Bollinger Mill was chosen to be preserved. I remember when you could drive across the bridge, but you’ll find out why that’s not possible when I do the bridge story. Thank you for the beautiful pictures. 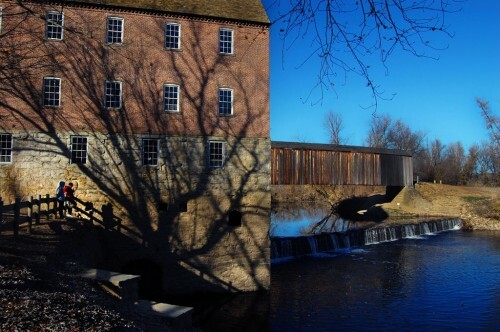 Our great, great great grandfather Joseph Lansmon built the covered bridge. We try often to visit and find it amazing that it is still standing. The care of the area all around is much to be admired. Just and update to let you know that I’ve posted the piece on the Burfordville Covered Bridge. Susan’s mother’s maiden name is Sutton. Her family lived in Gravel Hill and also the Crump area. Her grand uncle, Louie Walter Sutton, was working in the mill when it closed in 1950. 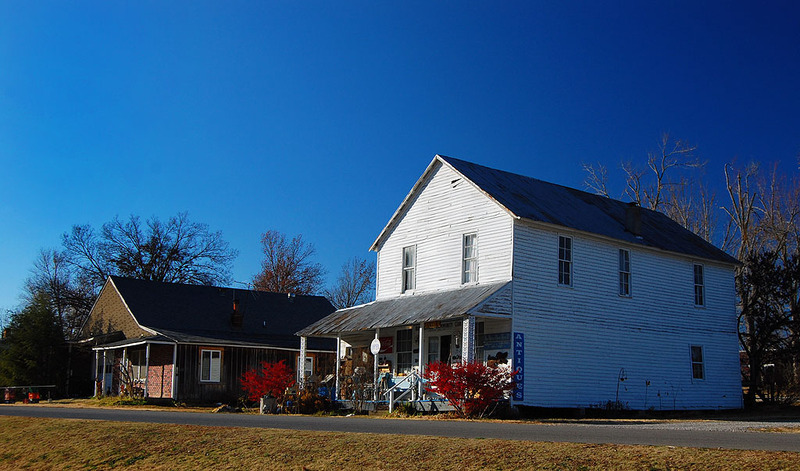 He most probably was the last to have the position of “miller.” If you look very closely to the writing painted on the front wall, above the porch roof, it says CAPE COUNTY MILL “C” — BOLTED MEAL and THE HOME OF A No. 1 FLOUR — L.W.S. (Louie Walter Sutton). He also gave most of the hand tools now displayed on the workbench on the second floor. The workshop still shows how it was set apart with the white paint on the walls. His initials can also be seen on the first floor, west side, as you descend the steps to the water turbine room. It also has the date “1918” which we do not know the significance of that date. The site administrator, Lesley McDaniel, is researching to find the significance of that date since Mr. Sutton was not working there in 1918. On the second floor is the fading mural of three river boats that was described often by Mr. Sutton, to the family. It was supposed to illustrate a race of riverboats at one time. One represents the riverboat “Cape Girardeau.” At different times there were three (3) riverboats with the name Cape Girardeau. At the dedication ceremony August 16,1981 he was among those recognized as former millers and/or workers at the mill. (At this time I do not have a website but I am posting pictures in an album on my Facebook page). According to former site administrator Jack Smoot, there are no plans to re-letter the message on the front. Also the term “bolted” flour refers to a finer sifting process to produce a product different from “whole grain.” Also on my 1975 picture of the mill front there is no front porch and also no ventilation chimneys, now replaced 2 on west and 2 on the east to handle dust. I wish you had a site where you could put your stuff up to a wider audience than Facebook users. You’ve got a treasure trove of photos and are a much better historian than I am. I always leave out an important items. Louie Walter Sutton DID do the mural on the second floor. Also, after leaving the mill in 1950, he moved his family to south Benton Street in Cape Giradeau and worked until retirement at the Jefferson School on Jefferson Street before it burned. He was born 1889 and died in 1976. Ken, I was hoping that the Cape County Milling Company, whose Gold Leaf flour was famous in the early 1900s, might still be around! I found a 1924 ad for Gold Leaf flour that extolled the cakes made by a black woman of Athens, Georgia, Aunt Laura Billups. Thanks for preserving this history for others to enjoy!